Welcome to Pancake Paradise Hawaii. 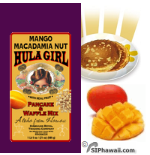 Macadamia Nut Pancake Mix & Hawaiian Island Foods - Waffle Mix. 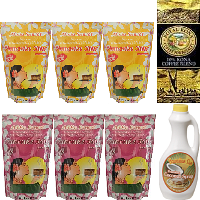 Coconut Syrup - Macadamia Nut cooking Oil - Luau Dessert - Ahi Poke Pupus. 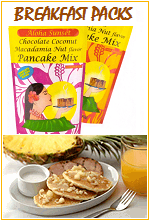 Try our popular Pancake MIX and MATCH packs or Hawaiian Breakfast packs. A Special occasion is never that far away. National PANCAKE DAY - Mardi Gras / Shrove Tuesday February 28 2017. 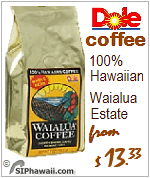 When shopping for Hawaiian Pancake mix compare prices with net weight. Pancake mixes come in 6oz, 8oz, 10oz, 16oz, 21oz packs. 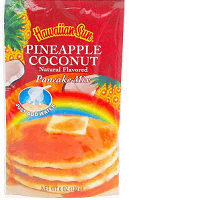 All pancake mix is shipped from Hawaii, FRESH from the source, and have not been redistributed to and stored on the mainland. 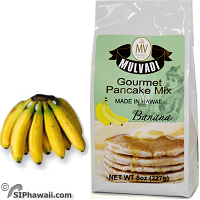 Hawaiian Style Pancake Mixes - It's BEST if it's FRESH FROM HAWAII - One Stop Save On Shipping. SHIPPING: USPS priority mail $14.45 for up to 15 pack. If it's cheaper it might be parcel post/standard mail' by boat and truck, taking 2-4 weeks. Don't just shop for a low price but also check shipping charges (example other stores 'standard mail': 3 pack $14 - 9 pack $17). Pancake mix. 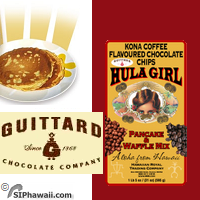 Hawaiian pancake products made and packed in USA Pancakes - Waffles - Puffs - Flapjacks - Griddlecakes - Panqueques - Crepes - Desserts. These easy-to-prepare pancake mix creates pancakes, crepes or waffles offer a tropical escape from boring breakfasts! Light and fluffy. Just add water. Hot cakes with real fruity flavors and chocolate chips from macadamia pancakes paradise Hawaii. 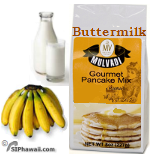 Hawaiian BUTTERMILK Pancake Mix - Mulvadi Gourmet - Unflavored Original, Banana, Coconut, Mango and Guava tropical flavors. 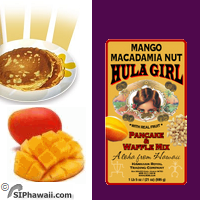 HULA GIRL Pancake mix - with REAL FRUIT - Mango Macadamia - Pineapple Coconut - Kona coffee Chocolate chip - Banana Macadamia. 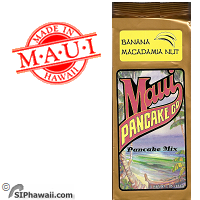 Maui Pancake mix Waffle mix - from the Rainbow Island of Maui, hot cakes 'old plantation' style. Banana - Pineapple - Chocolate Mac Nut. 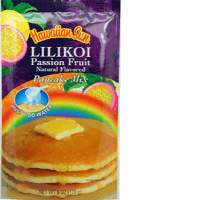 ALOHA SUNSET Pancake variety pack -3 light small 6oz gift packs. MACADAMIA NUT PANCAKE MIX for home, on the go - camping trips. 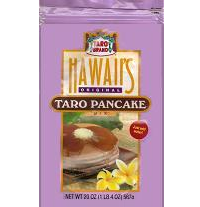 TARO Pancake mix -Taro Brand Hawaii's original Taro pancakes, waffles, crepes. 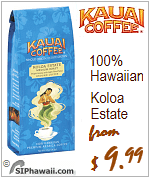 A traditional and delicious Hawaiian all-purpose flour mix. 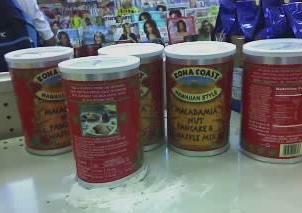 Kona Coast Pancake Waffle mix - Macadamia nut - Flapjacks Hawaiian Style. 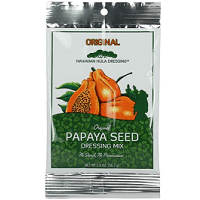 Dressings - LOW Calorie NO Oil - Papaya Seed Dressing - Original Recipe - Hawaiian Hula Dressing - Rainbow of Tastes. 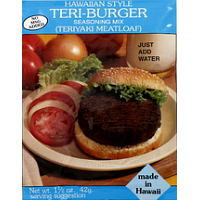 Hawaiian Style Seasoning mixes - Teriyaki burger/meatloaf mix - Sweet & Sour Spareribs- Curry sauce - Spicy Chicken - Made in Hawaii. Ahi Poke Mix - Pupus Seasoning - A Hawaiian party wouldn't be a party without ahi pupus - for happy hour and 'Pau Hana' appetizers. 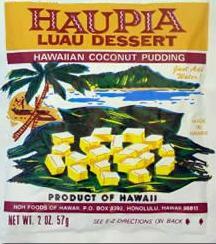 Luau Dessert - Haupia Coconut Pudding - Hawaiian Style Desserts - Made in Hawaii by Noh - Just add water. 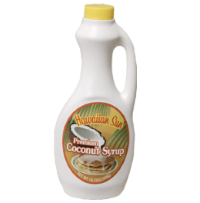 HAWAIIAN SUN Pancake Mix and Syrups - Natural flavored Hawaiian Pancake Mix - Just Add Water. Banana Macadamia, Passion Fruit - Lilikoi, Blueberry Acai, Strawberry Guava. Moist and delicious tropical pancakes. An island favorite since 1952. Start your morning right with our tropical flavored pancakes and syrups. 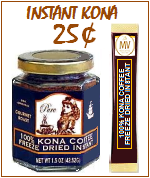 Try it with Hawaiian Sun's Coconut or Guava Syrup for an extra special tropical breakfast with a double burst of flavor. Available in 4 delicious flavors: Banana Macadmia Nut, Blueberry Acai, Passion Fruit - Lilikoi and Strawberry Guava. 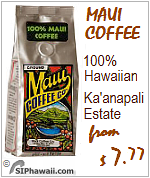 Hawaiian Sun packake mix CASE 24 $64.49 / 2.69 each - MIX AND MATCH - Email / Call. with USPS Priority Mail to the US 50. PO BOX and APO / FPO / DPO. 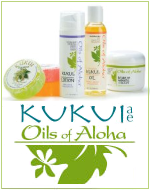 All products shipped from Hawaii to guarantee they are fresh from the source and have not been shelved in a warehouse on the mainland. Easy to work with. Just add water. Yield: 6 4 inch buttermilk pancakes per pack. Directions: Mix powder with ½ cup (118ml) of cold water until mix is completely moist. Use a wire whisk until the large lumps are gone. Pour about ¼ cup batter onto a 375° F / 190° C on lightly greased griddle. Cook pancakes for 1 - 1½ minutes per side or until edges begin to dry. Turn only once and Enjoy! For best result add a little butter on top. Got the mixes yesterday. Put them in Easter baskets for my staff. They are loving it. Margaret T. Washington DC. To spoil yourself at home, away or on a camping trip. 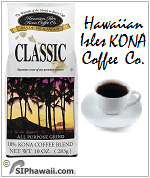 The combined fruity flavors and Hawaii's own Macadamia nut create a delicious breakfast treat. Light and fluffy, this easy-to-prepare mix creates pancakes, crepes or waffles that offer a tropical escape from boring breakfasts. Complete - Just add water! Each pouch is good for about 6 4 inch hot cakes. Instructions provided on pouch. Unflavored - Original, Banana flavor and Coconut flavor. Gourmet Buttermilk Pancake and Waffle mix made in Hawaii and infused with tropical flavorings for a warm, delightfully light and airy, but hearty and delicious breakfast. Available in 3 delicious flavors: Original unflavored, Banana and Coconut. 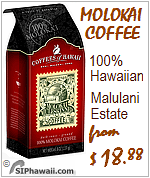 Mulvadi / Kona Aina Farms packake mix CASE 15 $44.85 / 2.99 each - MIX AND MATCH - Email / Call. Easy to work with just add water - complete buttermilk. Yield: 8 4 inch buttermilk pancakes per pack. Preparation instructions: Mix powder with water until mix is completely moist. Batter should be slightly lumpy. Pour about ¼ cup batter onto a 375° F / 190° C griddle. Cook pancakes for 1 - 1½ minutes per side or until edges begin to dry. Turn only once and Enjoy! Serve with a little butter on top. MAUI Pancake Mix - Let the Hawaiian islands bring you breakfast with Maui Pancake and Macadamia nut mix. Recipe for tropical pancakes provided on package. Hotcakes and waffles 'old plantation style'. Chocolate Macadamia nut - Pineapple Coconut - Banana Macadamia nut. Made in Maui - Hawaii. The Original Maui Macadamia nut Pancake mix. These pancake and waffle mixes are fast and simple to prepare. Just add water. 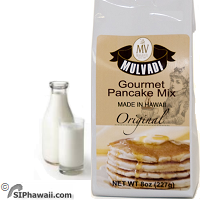 Shipping $14.45 for up to 15 pack of Maui Pancake Mix with USPS Priority Mail to US 50. PO BOX and APO/FPO. Recipe for Maui Waffles: 1 Cup pancake mix, ¾ - 1 cup water, 1 beaten egg, 1 tbsp. oil. Mix flour and water together. Fold in well-beaten egg and oil. Bake at once on a hot waffle iron. 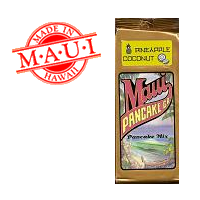 Recipe for Maui Pancakes: 1½ Cup pancake mix, ¾ cup cold water, 1 egg (if you wish, or 1 tbsp oil). Mix until batter is smooth. Pour about 3 tbsp. batter on slightly greased hot griddle, for each cake. Bake until bubbles brake over surface, turn and brown other side. 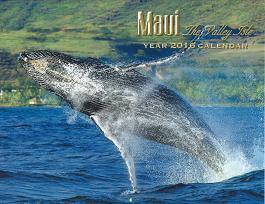 A Tropical Souvenir from Maui for that special occasion. 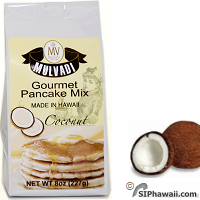 Pancake mix with Hawaii's own Macadamia nut and Coconut grown with Aloha. If you prefer a different composition or all of the same then Email us your selection within 2 hours of your order to sales siphawaii●com. 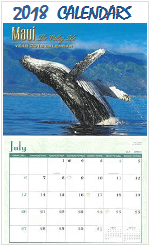 FREE 12 Page 2017 Maui Calendar letter size. See also our 'A Little Aloha' Page. Packed in an attractive foil bag to insure freshness. My mom LOVED her breakfast pack from you for Mother's Day... Cindy O. North Carolina. 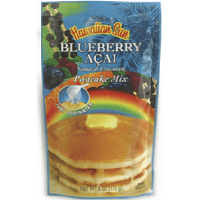 TARO BRAND Pancake mix - Hawaii's Original all purpose flour mix - In a handy 'zip' lock pouch for freshness and secure storage. Cultivated for centuries. Taro root is a food staple of Hawaii's native Hawaiians. Once harvested, the taro root is cooked and processed into poi, a traditional Hawaiian delicacy. By dehydrating the poi and blending it with wheat flour, Taro Brand, has created a delicious all-purpose flour mix. 1.25 Lb (20 OZ) - 567g. 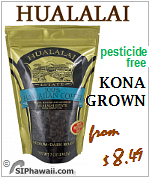 HULA GIRL Pancake Mix with REAL FRUIT bits - Kona Coffee Chocolate Chip - Mango Macadamia - Pineapple Coconut. What a way to start your day! With easy directions for small and large batches of hot cakes for up to 30 4inch pancakes - Just add water - For pancakes, puffs and waffles. 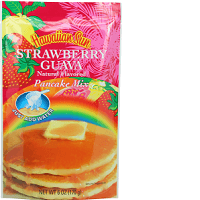 Chunks of REAL FRUIT with Hawaiian grown macadamia nuts in a buttermilk pancake base to make breakfast a treat. No preservatives. Compare with Kruzteaz artificially flavored imitation blueberry pancake mix with these REAL Fruit bits. 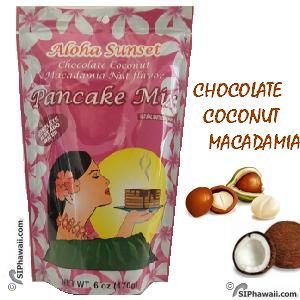 ALOHA SUNSET Pancake Mix Macadamia nut flavor with Taro, Chocolate Coconut and Banana flavors. 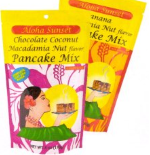 These tasty Aloha Sunset macadamia nut pancake mixes never go unnoticed by vacationers and wished they could have taken more home. 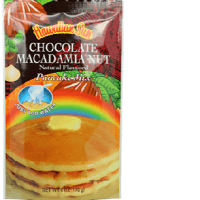 Hawaiian Macadamia Nut Pancake Waffle Mix variety in light, small and easy to pack 6oz pouches for home, away and camping trips. Complete - Just add water. Yield: 6 4 inch hotcakes per pouch. 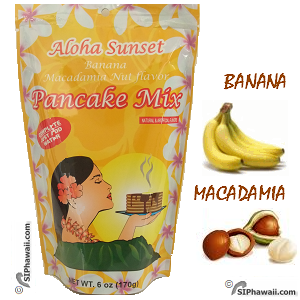 Aloha Sunset recently introduced a new look for their flavored pancake mixes, like the Banana, Taro and Chocolate below. By the Case $29.90 / $1.99 ea. I am looking forward to some excellent mornings thanks to some delicious Hawaiian pancakes. Peter M. Oregon. 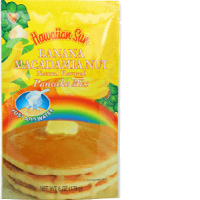 We have just returned from a Hawaii vacation and had brought back a package of the Aloha Sunset Banana Macadamia Nut pancake mix. I must say that I am not a big fan of pancakes as they are usually dry and tasteless. I made the pancake mix for my wife and I and could not believe the difference in your pancake mix!! The pancakes were light and fluffy and the flavor was out of this world. I only added a little butter and a hint of syrup. Normally I drown my pancakes in syrup just to be able eat them!! 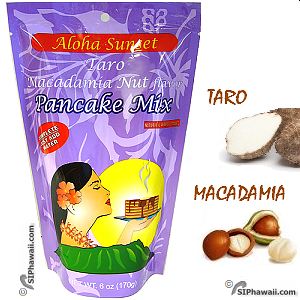 My wife ordered the variety pack and I made the Hawaiian style Taro Macadamia nut mix for breakfast this morning. Same thing, light and fluffy and very favorable. We haven't tried the Chocolate Coconut Macadamia mix yet but so far my favorite is the Banana Macadamia Nut mix. 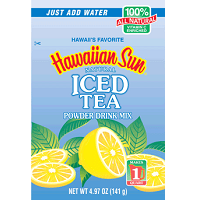 Hawaiian Sun Powder Drink Mix - Just Add Water - 100% ALL NATURAL Tropical Mixes and Iced Tea. Hawaii's favorite canned juices are now available in powder form. 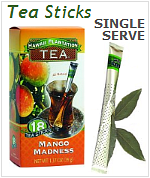 - MAKES 1 QUART - Environment friendly light sachets, easy to ship. These 100% natural tropical island refreshment drinks are equally enjoyed either cool or iced. 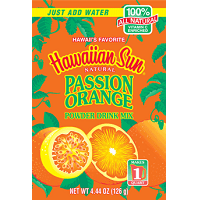 The flavors of Hawaii - vitamin C enhanced! In a handy flat pouch for at home - the office - camping trips and standby emergency bags. Available in 4 flavors and BY THE CASE. Naturally pink and exotic in flavor. A favorite with locals and visitors. 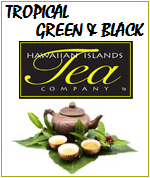 Hawaiian Sun Iced Tea is a smooth harmonious blend of tea and lemon. Sweet unforgettable scent of Lilikoi with just the right amount of 'pucker'. A delicate blend of Passion fruit and Orange, it's Hawaii's classic! 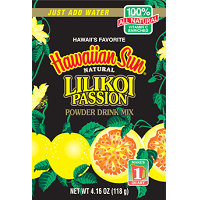 Hawaiian Sun healthy powdered drink mixes. Directions: Mix 1 Quart (32 oz.) 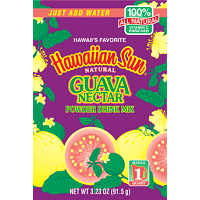 water with 1 package Hawaiian Sun drink Mix. Stir well until blended. Chill or serve over Ice and enjoy! 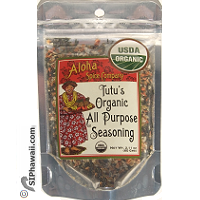 TUTU's Seasonings and Rubs Aloha Spice Company - for Meat, Fish, Pork and Chicken - USDA Organic. 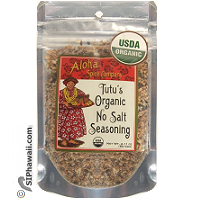 Tutu's organic and gourmet seasonings and rubs reflect the diversity of flavors and cultures unique to Hawai'i. These organic blends are made in small batches using the highest quality herbs and spices available - for Kitchen or BBQ. From the 'Garden Island of Kauai. All organic herbs and spices. Less salt, more flavor. No additives, chemicals or irradiation. Packed in re-sealable foil bags - Certified Organic by International Certification Services Inc. (CIS). For ingredients click on detail. For those that require salt free or prefer to add their own salt. 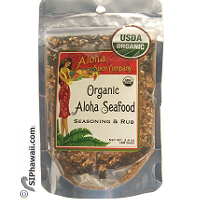 The Aloha Spice Company was founded by Chef Michael Simpson from Aberdeen, Washington. After receiving a BA in Art from Central Washington State University he expanded his artistic vision to food. In 1980 he completed a Professional Chef degree at the California Culinary Academy. He has over 30 years of culinary experience and has lived in Hawai'i for over 15 years. When he is not cooking he can be found surfing. NOH Foods Of Hawaii Seasoning and Sauce mixes - for Burgers, Meatloaf, Spareribs and Curry dishes. 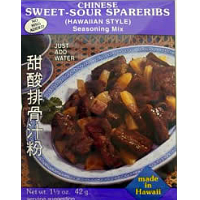 NOH makes the tastiest, most authentic seasonings and sauces for all your favorite Asian dishes Hawaiian style. 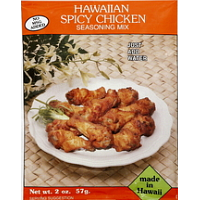 The secret ingredients of Hawaii's most popular chefs in NOH's Asian seasoning mix packets make every meal a hit. NOH products are made in Hawaii and bring the taste of the islands to wherever you are. 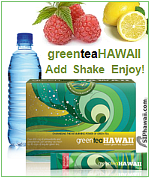 Light, small and easy to pack 1.5 oz pouches for home, away & camping trips - Just add water - No MSG Added - Made in Hawaii. 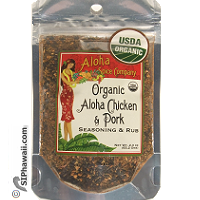 Teriyaki seasoning excellent with ground Turkey, ground chicken, etc. Serving suggestions on package. starts to thicken. Pour into a shallow pan and refrigerate. When set, cut into 1 1/2 inch squares. 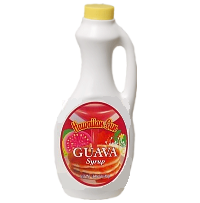 Other Suggested Uses: Hot Haupia Sundae - Pour hot Haupia pudding on your favorite ice cream. on a slice of pound cake and top with hot Haupia pudding. Sprinkle chopped macadamia nuts, grated coconut, and garnish with a cherry. Cake Frosting - Use Haupia as a frosting or topping on your favorite cake. Serving suggestions on package. 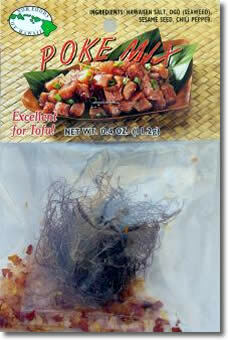 AHI POKE MIX - Hawaiian style pupus - Seasoning mix for fresh raw tuna fish - Ahi yellow-fin tuna, sashimi grade - diced. Poke (pronounced 'po-keh') means to slice or cut. Ahi is Hawaiian for Tuna fish comprising yellowfin, bluefin and bigeye. Aku is a small tuna (6 to 8 pounds) and has a light-colored meat similar to yellow fin. The Japanese call this fish "Katsuo". A Hawaiian party wouldn't be a party without ahi pupus or at happy hour - 'Pau Hana' appetizers. 1 pkg. 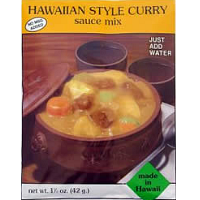 Hawaiian Poke Mix. package and place in a bowl. Let stand for 2-3 minutes. and cut into 1/2 inch pieces. Add 2 teaspoons of sesame seed oil. and mix well. Serve same day. slices and follow directions left. and follow directions on the left. 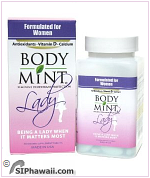 DISCONTINUED by Manufacturer around June 2014. 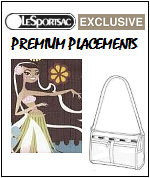 Choose an other brand on this page.